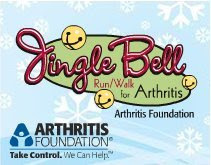 I think we’re good to go for the Jingle Bell Run. We have 19 team members. There is an early packet pick-up at Lutheran High School on Friday, December 5th from 4-7 pm. I also need to try to find someone to be in charge of any remaining packets on that Saturday morning. If someone could be responsible for picking those up on December 6th please e-mail me at Andy@GuyLloyd.com that would be great.